The article presents research on neutral beam current drive in Globus-M compact spherical tokamak. The experiments were performed in the plasma current range of 0.17–0.20 MA with a 0.4- or 0.5‑T toroidal magnetic field. The injection impact parameter was 33 cm. The variable parameters included compositions of plasma and the heating beam (hydrogen, deuterium), plasma density, and vertical displacement of the plasma column. The simultaneous increase in the plasma current and drop in the loop voltage were used to determine the neutral beam current drive. The injection of a hydrogen/deuterium beam into deuterium or hydrogen plasma resulted in a significant and reproducible drop in the loop voltage (up to 0.5 V). In order to process the obtained data, the authors developed an ASTRA code-based model, which allows one to calculate the neutral beam-driven current and bootstrap current. The share of noninductive currents as a function of plasma density during the injection of a hydrogen beam (28 keV, 0.5 MW) into the deuterium plasma was calculated. The authors analyze the results of experiments on off-axis beam injection achieved by vertical displacement of the plasma column and the effect of increasing the toroidal magnetic field on the consumption of the poloidal magnetic flux in discharges with atomic beam injection. 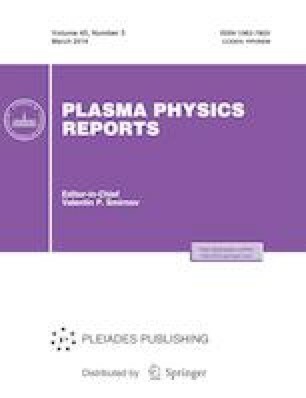 The authors would like to thank Globus-M tokamak personnel for their assistance with organizing and carrying out experiments and preparing this paper, as well as for their insight on the obtained results. Routine measurements of plasma parameters were performed under the state assignment at the Ioffe Institute, and measurements of neutral beam injector parameters were supported by the program of the P-residium of the Russian Academy of Sciences. The study of noninductive current drive in regimes with an early atomic beam injection received funding from the -Russian Science Foundation, research project No. 17‑72-20076.